THERE is just one undefeated team left in the Women’s SBL for 2019 after the Willetton Tigers beat the defending champion Lakeside Lightning on Friday night with the South West Slammers scoring two Round 5 victories as did the Joondalup Wolves. It was a fascinating weekend of action in the Women’s SBL beginning on Friday night with the Willetton Tigers handing the Lakeside Lightning their first loss of 2019, winning 76-67 at Lakeside Recreation Centre. The South West Slammers also beat the East Perth Eagles 78-43 and the Kalamunda Eastern Suns defeated the Cockburn Cougars 78-68. Then on Saturday night, the Joondalup Wolves bounced back from their first loss of the season to beat the Perry Lakes Hawks 69-59 while the South West Slammers beat the Cockburn Cougars 68-61 and the Warwick Senators defeated the Mandurah Magic 85-72. The round concluded on Sunday afternoon at Ray Owen Sports Centre with the Joondalup Wolves beating the Kalamunda Eastern Suns 80-66. East Perth hosted South West at Herb Graham Recreation Centre on Friday night looking for a first win in two years, but it wasn’t to be with the Slammers continuing to gather steam winning by 35 points. The Eagles came into the contest feeling a realistic chance of ending their losing slide, but the Slammers proved too strong including outscoring them 40 points to 15 in the second half to come away with the 78-43 victory. The win is a second straight for the Slammers as they improve to 3-2 on the season under new coach Nathan Grover while the Eagles slip to 0-6 for 2019 having now lost 38 consecutive matches. East Perth started quite well with 16 first-quarter points to only trail by two at quarter-time, but South West began to pull away in the second period to lead 38-28 at half-time. It was then a dominant showing from the Slammers in the second half starting with 20 points to 10 in the third quarter, and then 20 to just five in the fourth. The Slammers pulled in 64 rebounds for the game while dominating inside with 48 points in the paint while missing all 12 of their three-point attempts. East Perth did register 44 rebounds but also had 22 turnovers and shot just 24 per cent from the field and 35 per cent from the foul line. Makailah Dyer top-scored for South West with 16 points, nine rebounds and three assists with Beige Harris adding 12 points and three boards, and Brittni Montgomery 10 points and nine rebounds. Kate Fielding finished with nine points, six rebounds, six assists and three steals for the Slammers, Ebony Bilcich eight points, four boards and two assists, and Courtney Bayliss seven points and nine rebounds as she nears her 200-game milestone. Janee Johnson top-scored for East Perth with 10 points and nine rebounds with Ella Dimanlig contributing seven points and three boards, Cameron Flynn six points and seven rebounds, and Bree Fisher six points and four boards despite fouling out in 20 minutes. Fiona Heart contributed five points, six rebounds, three assists and two steals in her 200th SBL appearance. The defending champion Lakeside Lightning put their undefeated run on the line at home to Willetton on Friday night and it was the Tigers causing the upset claiming the nine-point victory. Including winning the championship last season, Lakeside entered Friday night’s clash on a 21-game winning streak having also won their opening four games of 2019. But Willetton wasn’t about to look at it as a task beyond them heading to Lakeside Recreation Centre and the Tigers’ reward was coming away with the 76-67 record to improve to 4-3 on the season with the Lightning falling to 4-1. The Lightning started the game well and went into quarter-time leading 18-12, but the Tigers turned on a remarkable second and third quarters. Willetton turned things around in the second term with 29 points to 13 to lead 41-31 at half-time. The Tigers continued that in the third quarter with another 23 points to 10 to lead 64-41 at three quarter-time. The Lightning did make a run in the last quarter but that only cut the Tigers’ winning margin to nine. New Willetton import Laina Snyder was outstanding putting in a match-winning display made up of 28 points, 20 rebounds, four assists, four steals and a block on shooting 10/18 from the floor and 7/11 from the foul line. Captain Desiree Kelley had a good night too for the Tigers with 17 points, six rebounds, three steals and two assists while Imogen Ayliffe contributed eight points and three boards, Sophie Maines seven points, four rebounds, four assists, three steals and two blocks, and Emma Gandini seven points and eight boards. Lakeside’s 21-game winning streak came to an end despite 11 points and 11 rebounds from Ash Grant. GeAnna Luaulu-Summers also had 15 points and four steals, Ali Schwagmeyer 13 points, nine rebounds and four assists, and Courtney Byrnes 12 points, five boards and three assists. Two teams determined for a win to stay in early season touch with the top eight did battle at Wally Hagan Stadium with the Kalamunda Eastern Suns ending up beating the Cockburn Cougars by 10 points. The Cougars had started their season beating Willetton and East Perth, but had lost to Rockingham last up prior to the bye last week. The Eastern Suns lost their opening three games of the season but broke through last week beating the Slammers on the road so there was plenty on the line for both teams coming into the Friday night battle. The Cougars started strongly on their home floor to lead 21-12 by quarter-time but the Eastern Suns bounced back in the second term to cut Cockburn’s half-time lead to 33-30. The Suns then dominated the second half starting with 19 points to 11 in the third quarter. They added another 29 points to 24 in the fourth to come away with the 78-68 win. Jennie Rintala led the way for the Eastern Suns finishing the night with 19 points and eight rebounds including hitting 3/6 from downtown and nailing 8/10 from the charity stripe. Jewel Williams continued her strong form coming off 26 points last week with another 15 points, three rebounds, three assists and two steals. Lauren Jeffers returned too for Kalamunda and had 14 points, seven rebounds, five steals and four assists with Hannah King contributing 13 points and six rebounds, Georgia Adams six points and Tarryn McPherson six points and two rebounds. Matilda Muir top-scored for the Cougars with 23 points, five rebounds and three steals while Kisha Lee struggled to play just 16 minutes for eight points and four boards. Nicole Roberts added 10 points, nine assists and four steals for Cockburn, Akim Lual nine points and four rebounds, and Ruby Benn eight points and three assists. The Joondalup Wolves responded well to their first loss of the season beating the Perry Lakes Hawks by 10 points at HBF Arena on Saturday night. The Lady Wolfpack had started life under new coach Charles Nix impressively winning their opening four games before falling afoul of the Lakeside Lightning on the road last Friday night, losing by 20 points. But the Wolves responded well back on their home floor on Saturday to record the 69-59 victory on the back of an impressive defensively display. The win improves the Lady Wolfpack to a 4-1 record on the season while the Hawks are 2-3. The Lady Hawks actually started well on the back of winning their last two games against the Redbacks and Magic, with the visitors leading 15-13 by quarter-time. The Wolves were able to turn that around in the second period to go into half-time leading 30-25. By the full-time buzzer, the Wolfpack had extended their advantage to 10 to come away with their fourth win of the season. Kayla Steindl delivered a strong showing for the Wolfpack finishing the evening with 20 points, 11 rebounds and two steals on shooting an efficient 6/10 from the field and a perfect 7/7 from the foul line. Captain Amy Kidner continued to come off the bench and produced another 14 points, six rebounds, three assists and two steals with Isabelle Miotti adding 10 points, five rebounds and four assists. Sarah Donovan top-scored for Perry Lakes with 17 points and 11 rebounds with Rebecca Benson contributing 13 points, four rebounds and four assists, and Kristan Teasdale 11 points, five boards, two assists and two blocked shots. Nikita Martin didn’t quite have the impact she would have hoped against the club she played her first 159 games with, ending up with just five points and two boards. The South West Slammers returned home fresh from a Friday night win and made it two from two in Round 5 of the Women’s SBL beating the Cockburn Cougars by seven points. The Slammers beat East Perth by 35 points to open the round on Friday night and backed that up at Eaton Recreation Centre 24 hours later with a 68-61 win over a Cougars team who had also lost at home to the Eastern Suns on Friday. The Slammers shot out of the blocks impressively with a 24-point first quarter while holding the Cougars to just 13. While Cockburn stayed in touch cutting the home team’s lead to 40-32 by half-time and then trailed by just one at three quarter-time, the Slammers did enough in the final term. While holding the Cougars to just eight points in the fourth period, the Slammers did enough to win by seven to make it three straight wins and improve to 4-2 on the season. The Cougars have now lost three straight to be 2-3. Brittni Montgomery had a strong game inside for the Slammers to be instrumental in the victory with 21 points and 13 rebounds on shooting 9/13 from the field in her strongest showing since the season-opener. Courtney Bayliss added 11 points, eight rebounds, five assists and two steals for the Slammers with Makailah Dyer ending up with 10 points and six boards, Bianca Donovan nine points, three rebounds, two assists and two steals, and Kate Fielding four points and nine boards. It was always going to be tough for the Cougars once they lost Kisha Lee a minute into the contest. Captain Vanessa Michael ended up top-scoring with 13 points and eight rebounds with Ruby Benn adding 12 points, five rebounds and five assists, Matilda Muir 10 points and eight boards, Haylee De Sousa eight points and two rebounds, and Akim Lual eight points, five boards and two steals. The Warwick Senators continued their strong start to the Women’s SBL season with the additions of Stacey Barr and Samaria Howard to beat the Mandurah Magic 85-72 at Warwick Stadium on Saturday night. The Senators came into the game fresh off a win the previous Saturday night in their home opener against Willetton while Mandurah’s three-game winning run came to an end on the road to the Perry Lakes Hawks. With each team making their only appearance of the weekend, they were fresh and the Senators were stocked up with Stacey Barr and Samaria Howard playing their first games of the season even if they are still awaiting Sam Roscoe, Maddison Hooper, Rebekah Throns and Hannah Throns. The Magic weren’t quite at full strength still without Carly Boag with Bree Klasztorny also not making the trip to Warwick Stadium. Warwick made on ominous start thanks to Barr who knocked down two triples and converted a three-point play in the opening five minutes to put her new team up 11-6. A pair of triples from Delany Junkermeir kept Mandurah in touch as did a three on the quarter-time buzzer from Rachel Petit, but the Senators still led 26-19. Barr and Bianca Villegas helped Warwick’s lead extend to double-figures to start the second period, but Casey Mihovilovich helped the Magic get back in touch and then a step back jumper by import centre Ginka Palusna had them back within just two heading towards half-time. The Senators led 42-33 at half-time but the Magic got going in the third period and by the time Kasey Miegel converted a strong three-point play under the basket, they were within two points with a minute of the quarter to play. Samaria Howard ensured Warwick still held that narrow two-point lead at three quarter-time and then it was all the Senators in the final term holding Mandurah to just 11 points while scoring 22 themselves to win by 13. Stacey Barr top-scored for the Senators with 18 points, nine rebounds and four assists with Caitlyn Jones offering plenty off the bench with 12 points in 15 minutes. The frontcourt of Bianca Villegas (13 points, 15 rebounds, four assists) and Tayla Hepburn (13 points, three boards, three blocked shots) battled hard while Chloe Forster put up eight points off the bench and new import point guard Samaria Howard finished with eight points, four rebounds, three assists and two steals. Casey Mihovilovich continues to show no signs whatsoever of slowing down, producing 21 points, nine rebounds and seven assists on 7/13 shooting from the field in her 472nd SBL appearance. Ginka Palusna played all but 1:12 of the game to end up with 16 points, 14 rebounds, three steals and two assists while Delany Junkermeir contributed 15 points, five boards and three assists, and Emma Klasztorny 10 points and seven rebounds despite battling foul trouble through the night. 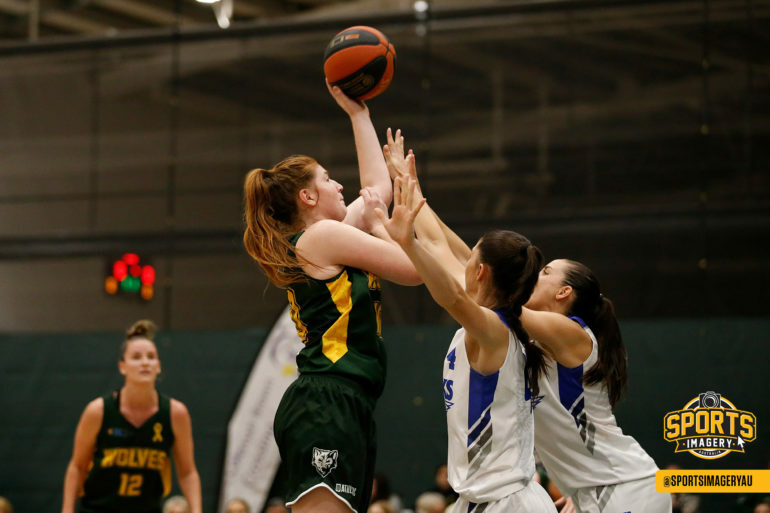 The Joondalup Wolves capped off a perfect weekend in response to their first loss of the 2019 Women’s SBL season beating the Kalamunda Eastern Suns 80-66 on Sunday. With both teams coming off wins already in Round 5, it was a tight opening until Kayla Steindl, Chelsea Belcher and Isabelle Miotti gave the Wolves a 6-0 run to lead 12-6. Rebecca Motroni responded with a three for Kalamunda and Jewel Williams knocked down another soon after from downtown to keep the Suns within one. The Wolfpack only led 17-16 by quarter-time and despite another 8-0 run capped off by a Belcher triple saw them lead by eight, the Eastern Suns stayed in touch and the visitors led just 37-31 by half-time. It was a determined Wolves team that came out of half-time ready to take the game out of reach and they did that piling on 27 points in the third term while keeping the Eastern Suns just to 10 points. That saw Joondalup lead 64-41 by three quarter-time and despite Kalamunda producing an improved last quarter where they outscored the Wolves 25 to 16, the Wolfpack still won well by 14 points managing to take advantage of their edge in size and athleticism. There wasn’t much that separated the teams statistically-speaking with the Wolves ending up pulling in eight more rebounds but they did have 19 turnovers to 18. In the end, the Wolves shared the ball better with 24 assists on their 29 field goals while they shot the ball better too. The Wolfpack ended up going 29/68 at 42 per cent from the field with Kalamunda going 23/70 at 32 per cent. Chelsea Belcher finished the afternoon with 14 points for the Wolves with fellow guard Mikayla Pirini adding 14 points, five assists and three rebounds. The pair combined for 7/15 from three-point range. Kayla Steindl also had 13 points, 13 rebounds, three assists, two steals and two blocked shots for the Lady Wolfpack while Amy Kidner contributed 13 points, six boards, four steals and two assists, and Isabelle Miotti eight points, five rebounds and five assists. Jewel Williams continued her strong form for the Eastern Suns with 16 points, four rebounds, three assists and two steals while shooting 5/11 from the field, 3/7 from beyond the arc and 3/4 from the foul line. Chanah Crugnale produced 16 points, six rebounds and two steals off the bench for the Suns on shooting 6/10 from the field and 3/5 from deep too. Jennie Rintala finished with eight rebounds, six rebounds and four steals, Hannah King seven points and five boards, and Lauren Jeffers six points, three rebounds and three assists despite shooting just 2/14.